After recovering from all the driving to Tucson, I got right back to work. Then I spent a wonderful Thanksgiving week with my son home from college. We made a total of 4 trips back and forth to Phoenix! He flew back to school in Ohio yesterday, and I'm back to work in my studio again. As you can see, I've done big boxes, too. Here are two slightly different views of one box. 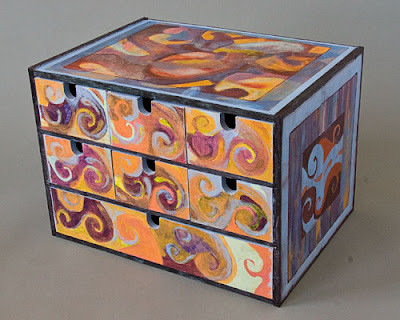 It has six small and one large drawer. 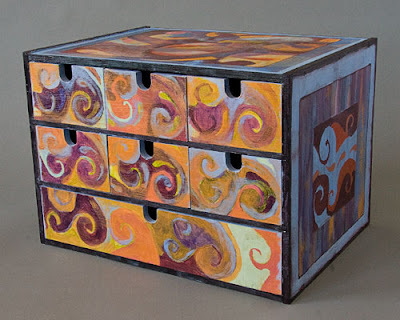 It's great fun to paint these boxes, which are 10" tall, and 10" by 14" wide. I made one for myself and I use it as a jewelry box, but I think it would be a good place to keep all kinds of treasures.